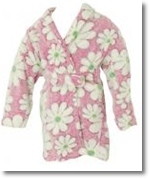 From very young to preteen, girls robes are a very popular sleepwear item. Fun to wear as well as practical and comfortable, kids robes, much like womens robes come in a variety of styles that can be used in many different situations. The added bonus is that because they are comfy and cozy, little girls love to wrap themselves up in them! The first and most obvious use is an absorbent wrap robe for after a shower or bath. ...are a great choice since they are usually made of an easy to care for fabric like cotton that washes and wears very well. This fabric is soft on the skin, which is important when dealing with tender little ones, and is also quite water absorbent, like a bath towel. Both long and short robes in cotton come in an amazing array of different styles and colors, but its important to remember that long robes can be a safety hazard for tripping. When it comes to choosing colors, opt for fun and funky colors and patterns or their favorite cartoon characters to keep things interesting. 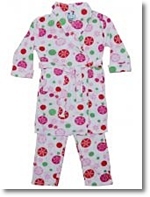 The second use for girls robes are over their night gowns or pajamas, or as part of a matching girls sleepwear set. These kinds of robes are usually made of a thinner material, like a lightweight cotton or polyester, and provide extra warmth over their sleepwear. They usually aren't slept in, but instead just add a light, additional layer. It can be fun for girls to have a matching robe with their dolls as well, and these are available at stores like Disney or even through online shopping. 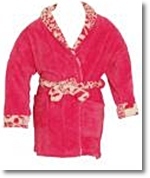 The third type of girls robe is a swim or beach robe. Again, long robes are not a good choice for around a pool or at the beach, again because little girls and children can be prone to tripping and falling. Instead, opt for super absorbent fabrics like terry cloth robes or thick short cotton robes that will keep them warm and tend to dry quickly. hooded robe is another great choice since it can be worn to the pool during the winter or summer, plus it protects wet hair from the elements. These types of robes usually also have pockets for girls to keep their little hands warm, which is great if you live in a colder climate. Girl’s robes are one of the most versatile styles that girls (and their parents) reach for time and time again. Little girls, much like big girls love to have a special robe to wear while they get their hair finished and before getting dressed. They're warm, comfy and cosy and the nice thing is that they also promote modesty with girls as they start to grow up and mature into young ladies. Cute and practical for almost every occasion, they make wonderful gifts and presents that last for years and years.